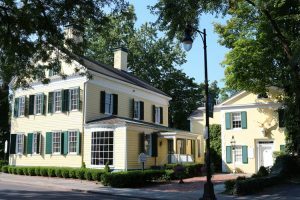 The Fred Johnston Museum is located in Kingston’s Stockade district and is a must see! The museum is a Federal style house, cir. 1812, built by state senator John Sudam. The exquisite home features 8 rooms furnished by the Fred J Johnston Collection. The Johnston collection features mostly American decorative arts, glassware, and furniture from 18th and early 19th century. What about celebs?!! In the home’s heyday the museum has lodged prominent guests such as writer Washington Irving and President Martin Van Buren.